These are the same playing cards used by the pros on TV's World Poker Tour, but they are 100% plastic! Long lasting, crisp, flexible, and completely washable, these all-plastic WPT Decks feature the durability that serious, active Hold'Em players need. The minimum order is one two-deck set. All quantities (sets, dozens, etc.) feature half white and half black decks. 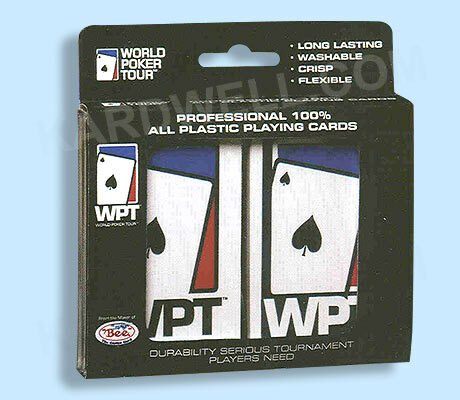 For additional information or wholesale pricing on World Poker Tour Playing Cards, please contact us at 1-800-233-0828. Sale Price: $9.92. Was $29.50. Save 66%!